Damen Verolme Rotterdam (DVR) has completed a major refit of the Stena Drilling-owned 5thgeneration, semi-submersible drilling rig Stena Don. The vessel arrived at DVR in October 2018 and departed for her new contract off the UK’s Shetland Islands in February 2019. The most significant aspect of the works was the installation of an eight-point mooring system for her future drilling contracts. By using this for holding position, emissions will be significantly reduced and substantial savings on fuel costs will be made. The upgrade also enables the rig to work in shallower waters than before which greatly increases her operational envelope. DVR, one of Damen Shipyards Group’s most experienced yards in the repair and refit of complex offshore structures, began preparations for the installation of the new mooring system well before the Stena Donarrived at the yard. Various elements of the system were manufactured by Damen in advance including the anchor chain lockers and sponsons. Weighing 1,200 tonnes in total they were fabricated at Damen Shipyards Mangalia before being shipped to Rotterdam. On the 18thof February the Stena Donexited the yard for the reinstallation of its six DPS thrusters in the deep water of the Port of Rotterdam’s Maasvlakte. The official handover to Stena Drilling followed on 26 February, in line with the original schedule. The following day she departed for Bergen for inclination tests and additional assessments prior to starting work off the Shetland Islands. 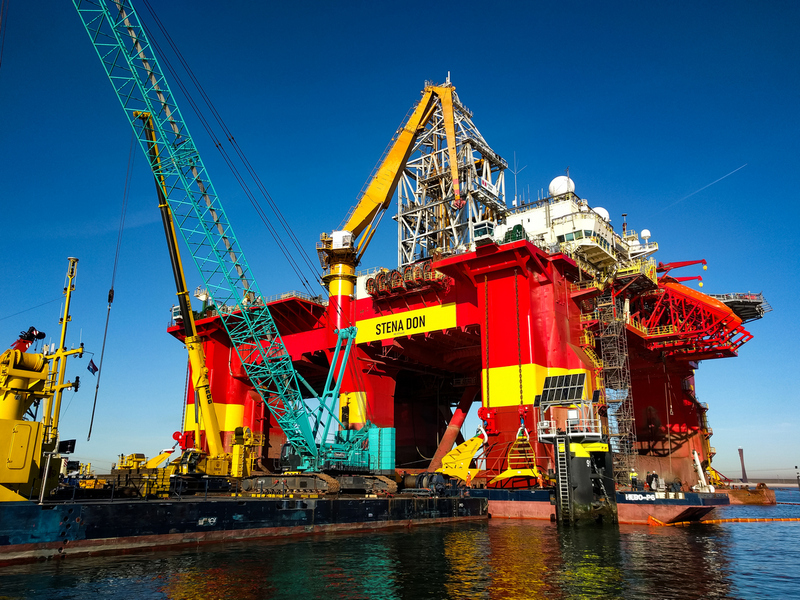 The Stena Don, a harsh environment, dynamically-positioned, 5thgeneration semi-submersible drilling rig, can drill in waters up to 650 metres deep and has an upgraded accommodation capacity for 140 personnel. 95.5 metres in length and with a beam of 67 metres, it was built by the Kvaerner Warnow Werft Shipyard in Germany in 2001. This was the drilling rig’s fourth visit to the DVR site, with its most recent stopover in July 2015 when it came in for a special periodical survey and a mid-life upgrade.